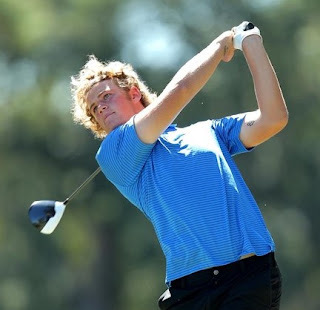 Annan's Duncan McNeill achieved a top-10 finish and helped Toledo University to finish second in the weekend Mission Inn Spring Spectacular college 54 hole tournament at Mission Inn Resort and Club's El Campeon course at Howey in the Hills, Florida. Duncan, pictured, had rounds of 73, 75 and 73 for a total of 221 over a par 72 course of 6,834yd. He finished T10 behind the winner by four shots, David Ravetto (Texas Christian) who scored 70, 69 and 70 for 209. There were two other Toledo students with UK connections in the field of 85 competitors. Thomas Thurloway from Crawley, England finished T16 on 223 with rounds of 78, 71 and 74. Stephen Watts from Larne, Northern Ireland shot scores of 78, 73 and 75 for a total fo 224 and a T19 finish. Joseph Bryce had to retire with a back injury after completing rounds of 77 and 72.